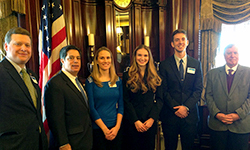 Three Duquesne University students, including Anastasia Ipatova and Lindsey Sosnowski of the School of Pharmacy, presented posters and met with legislators at the 14th Annual Undergraduate Research at the Capitol-Pennsylvania Conference in early April. Ipatova and Sosnowski presented a poster titled Direct Costs of Pulmonary Manifestation of Alpha-1 Antitrypsin Deficiency: Policy Implications for Third Party Payers. Dr. Khalid Kamal oversaw the research. 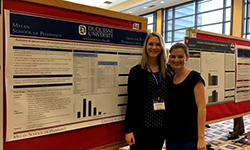 Additionally, two School of Pharmacy research projects earned recognition at the 2016 Duquesne University Undergraduate Research and Scholarship Symposium. The poster Development of Design Space for Fluidized Bed Multiparticulates Coating Process by Kianna Motto and Hanzhou Feng under the guidance of Dr. Carl Anderson won the Mylan School of Pharmacy Award for Undergraduate Research, while a poster by Sabina Vaichys, Paige Coleman and Matthew Sears earned a honorable mention from the Phi Kappa Phi National Honors Society for the project Evaluation of Appropriateness of Vaccination Procedures of the 13-Valent Pneumococcal Conjugate Vaccine and the 23-Valent Pneumococcal Polysaccharide Vaccine in a Hospital Setting. Drs. Branden Nemecek and Anthony Guarscio advised the group.